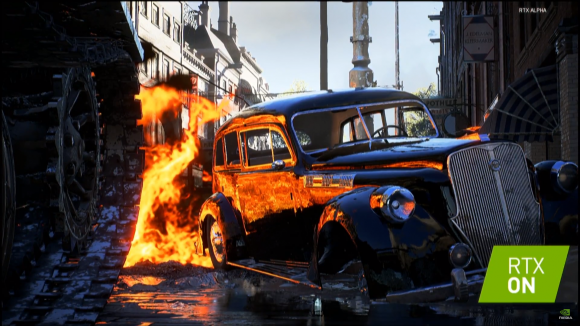 While the current ray tracing alpha build of Battlefield 5 we’ve been playing with is currently dependent on Nvidia’s RTX graphics cards, that doesn’t have to be the case going forward. Because DICE has built the gorgeous-looking ray traced reflections using Microsoft’s DirectX Ray tracing API, it can be made compatible with any GPU that has support for Microsoft’s upcoming tech. The whole point of DXR is that it can be used as an almost plug and play module in, or alongside, the traditional DirectX API. That means any hardware that is made to be compatible with the new API will also be compatible with any titles that use DXR to enable the advanced visual effects in-game. Whether that be a new AMD architecture or even a future Intel discrete gaming GPU. At the moment, however, it’s all rather moot as neither of Nvidia’s GPU competition has made any noises about even getting close to putting ray tracing at the fore of their design efforts for upcoming architectures. The next-gen AMD Navi GPU is only set to be a mainstream replacement for the Polaris technology – so it’s unlikely to have anywhere near the necessary dedicated grunt for ray tracing that Nvidia’s mighty new RTX 2080 can boast – and who knows what Intel is planning. 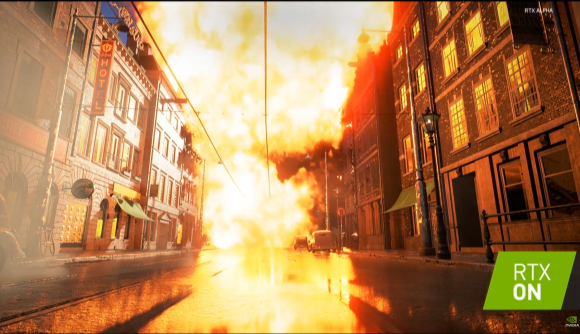 But if the introduction of genuine real-time ray tracing in games, spear-headed by Nvidia’s line-in-the-sand moment, does kickstart a new era of advanced PC graphics then it’s important for the other key players to try and keep up with the green team. And if the competition can somehow follow the seriously impressive start that Nvidia has made in this new area of PC graphics then the fact this year’s DXR games aren’t necessarily limited to Nvidia tech is going to be good for everyone. But even though everything is optimised for Nvidia’s RTX cards, and is currently intrinsically linked with its technology, Holmquist seemed certain that it wouldn’t be a problem to port the build to alternative DXR-capable hardware. Honestly though, I think we’re more likely to see another generation, at least, of RTX GPUs from Nvidia before AMD or Intel even get close to talking about their own potential for real-time ray tracing, let alone competing with the GeForce gang.